Makes 12 big, fat wraps. Preheat oven to 200 degrees celsius. Wash all herbs and allow to dry. Rinse quinoa well, and put into a small pan with two cups of water and bring to a boil, then reduce and cover. In another pot, add onion and garlic with a dash of water and put over low heat. Add more water (in small increments) if the onion/garlic sticks to the pan, but frequent stirring will avoid this. Cook both quinoa and onion/garlic for 15-20 minutes and set aside. Once fully soaked, process the chickpeas and coriander until fine (but not a paste!). In a large bowl, mix processed chickpeas and coriander with the cooked onion/garlic and remaining falafel ingredients. Pick up small fistfuls of the mixture and press into balls roughly the size of a lime - avoid making them too big! Lay the falafels on a lined baking tray with plenty of room around each one so that they cook evenly. Bake for 30 minutes, and if possible broil for the last 3 or so minutes for a perfect exterior. 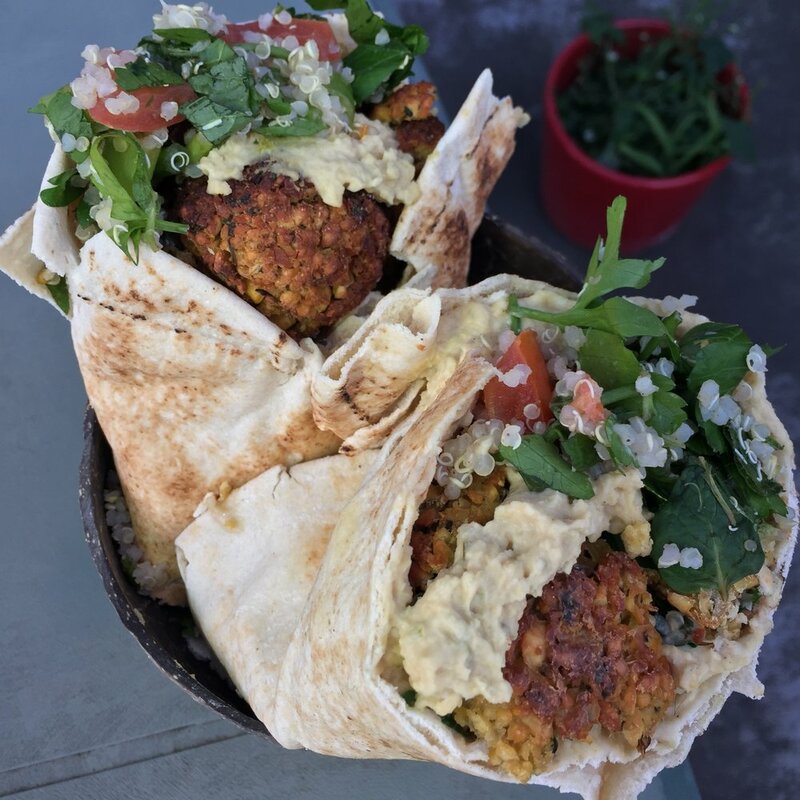 While the falafels are cooking, finely chop the parsley, mint, green onions and tomatoes before combining with cooked quinoa and the remaining tabbouleh ingredients. Mix well. Lay out the pita bread and smear the a hefty portion of hummus. Cut the cooked falafels in half before adding them on top with the tabbouleh. Drizzle tahini to taste, wrap up all the ingredients and for best results pop the wraps back in the oven for 5 minutes to warm them up before serving! Thoroughly rinsing your chickpeas prior to soaking, and after soaking is key! Leave them to soak for at least 10 hours.